In China, cosmetic ingredients are divided into two categories: new cosmetic ingredients and existing cosmetic ingredients. A variety of inventories and lists are used to regulate cosmetic ingredients, such as the prohibited ingredients list and the restricted ingredients. Manufacturers of cosmetics need to comply with the requirements of each list. According to Chinese cosmetic regulations, new cosmetic ingredients to be used in the products require pre-market registration with China Food and Drug Administration (CFDA), (formerly State Food and Drug Administration) hence cosmetic manufacturers need to judge whether an ingredient is new or not prior to manufacture. Before 2003, cosmetic ingredients were regulated based on the Hygienic Standards of Cosmetics issued in 1987, which covered the regulated ingredients of prohibited substances, restricted substances, preservatives, UV Filters and Skin Colorants. Under this regulation, figuring out the status of an ingredient was difficult until the first publication of the Inventory of Existing Cosmetic Ingredients in China (IECIC) on 27 April 2003 released by Ministry of Health (MOH), the competent cosmetics authority at the time. Cosmetic ingredients listed in the IECIC are regarded as "existing" ingredients and exempted from registration with the CFDA. IECIC 2003 once served as the gold standard reference for determining the regulatory status of cosmetic ingredients. The IECIC 2003 covered 3265 cosmetic ingredients that were used in China but was far from a comprehensive reflection of all ingredients used in the market and did not align with international markets. A large number of recognized and globally accepted ingredients that had scientifically established safety records and a long history of safe usage were not included in the IECIC, which created a major issue for multinational companies. Furthermore, the IECIC 2003 was an internally circulated inventory that only provided the names and CAS numbers of ingredients without giving detailed information on the restrictions and other requirements of their use. Meanwhile the rapid development of the cosmetic industry and a significant increase in import and export trade left the IECIC 2003 ill-equipped to deal with China's cosmetics industry. From 1 Sep 2008, CFDA took over the full responsibility of cosmetic supervision from the MOH. In order to guarantee safe use of existing ingredients and facilitate the determination and registration of new ingredients, CFDA started the amendment of IECIC. On 6 November 2011, CFDA issued the first batch draft of IECIC for public consultation, which contained altogether 1710 existing ingredients in the Chinese cosmetic market (See CL news on 8 December 2011). Compared with the IECIC 2003, the IECIC 2011 (first batch) only contained about a little more than half of the ingredients. However, SFDA strengthened the restriction on the permitted use limit of existing ingredients and the use scope for certain ingredients. 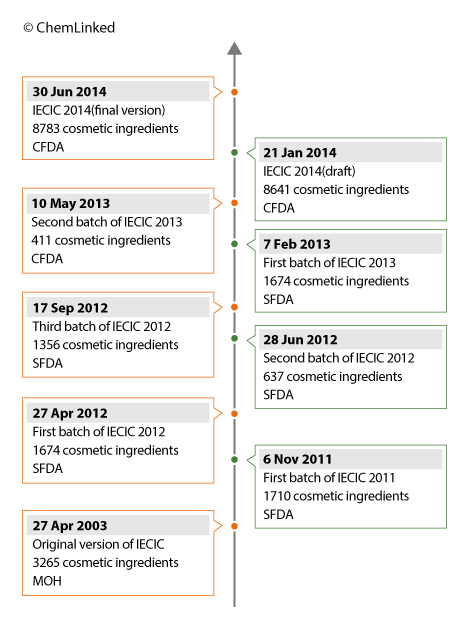 In 2012, CFDA released 3 draft batches of IECIC, totaling 3,667 ingredients (See CL news on 18 September 2012). It was noted that the new inventory not only listed the Chinese names and the INCI names of existing cosmetic ingredients but also specified the limit for ingredients restricted to be used in cosmetics. In 2013, the CFDA finalized 2 batches of IECIC containing 2085 substances in total (See CL news on 14 May 2013). 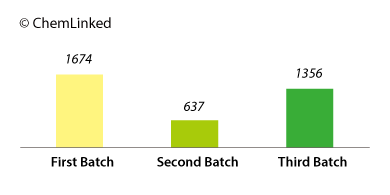 It was expected the third as well as the last batch of IECIC 2013 will be published in the near future. However CFDA chose to abandon the batch-wise release approach. Instead of a batch-wise approach the CFDA decided to publish an integrated existing cosmetics inventory. On 21 Jan 2014, a consolidated list of IECIC 2014 containing 8641 existing cosmetic ingredients was released by CFDA for public comments (See CL news on 23 January 2014). 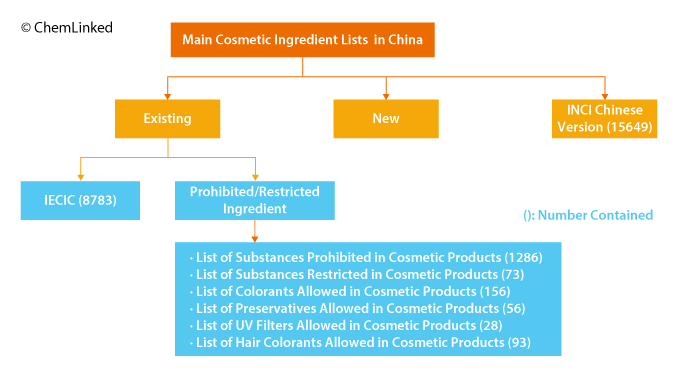 The release of this consolidated list is a favorable turn in the process of cosmetic ingredient regulation in China and will greatly aid in the industry and policymakers alike. Although the draft version of IECIC 2014 was heralded as an integrated list, a large number of ingredients that have been already used in the Chinese cosmetic industry were still not included especially those contained in non-special use cosmetics produced in China. This regulatory loophole was caused by the fact that the registration of domestic non-SUC is not centralized by CFDA but handled by provincial FDAs of varying capacities and competencies. This situation is compounded by the fact that a national system for recording ingredients used in this category is not available. Such being the case no one, not even the CFDA knows how many cosmetic ingredients in widespread circulation have not been included in "the draft version of IECIC 2014". Additionally, the draft contained quite a few errors, a source of major concern amongst the cosmetics industry. To improve this situation, on 11 Mar 2014 CFDA announced a national IECIC supplementation scheme, a move to urge domestic cosmetic manufacturers to notify any ingredients used in their non-SUC products that were excluded from the draft version of IECIC 2014 (See CL news on 12 March 2014). After two phases of public comments, on 30 June 2014 CFDA finalized the IECIC 2014 to 8783 ingredients which now serves as the sole reference for determining the regulatory status of a cosmetic ingredient (See CL news on 2 July 2014). The number of 8783 ingredients represents a significant increase in the number of existing cosmetic ingredients in comparison to the previous versions. Furthermore, CFDA has officially clarified issues regarding ingredients of plant origin which have in the past been a source of great confusion for industry. If an ingredient listed in the IECIC 2014 is also a restricted substance in the Hygienic Standard for Cosmetics 2007, it should be used in conformity with corresponding restriction requirements, such as application scope, maximum permitted concentration in the finished cosmetic products, warnings, etc. Please click here to download the bilingual version of IECIC 2014 (final version) prepared by ChemLinked. 3265 cosmetic ingredients in total. 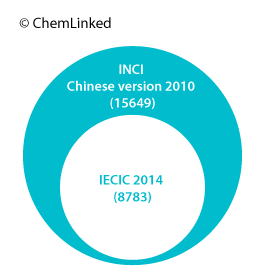 Cosmetic companies might confuse IECIC with the INCI Chinese Version and falsely regard ingredients in the latter as "used or existing" in China. It is worth clarifying that the INCI Chinese Version is translated with the main purpose to standardize the translation of INCI name and cosmetic labeling and instructions, which is certainly not a criterion for determining the regulatory status of an ingredient. The INCI Chinese Version was first published by the MOH in 2007 with 12072 ingredients, which was translated according to the International Nomenclature Cosmetic Ingredient (INCI) names included in the International Cosmetic Ingredient Dictionary & Handbook Tenth Edition (2004) (ICI Dictionary) managed by the Personal Care Products Council (PCPC), previously the Cosmetic, Toiletry and Fragrance Association (CTFA). The List is updated accordingly with the expansion of the ICI Dictionary. The latest version containing 15649 ingredients was translated and released by CFDA in 2010, based on its twelfth Edition (2008). Cosmetic manufacturers are required to label the ingredients using the standard Chinese names if they are covered by the List. According to the PCPC, the ICI Dictionary has been updated to its 14th edition in 2012 with more than 19,000 INCI labeling names for the United States, the European Union and other countries. These are cross-referenced to more than 66,000 trade and technical names and nearly 4,300 suppliers from 106 countries. The total number of ingredients of IECIC 2014 is just around half of that in the ICI Dictionary so a great many substances that are internationally accepted for use in cosmetic products and personal care products cannot be used in China without approval. 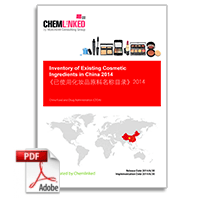 On June 16 2015, China Food and Drug Administration announced it is to append the Inventory of Existing Cosmetic Ingredients in China 2014 (IECIC). A draft list of 147 ingredients was released for public consultation. The period for public consultation will end on June 25. The main changes made by the CFDA is the correction of the ingredient naming errors made in the 2014 IECIC. 20 ingredients were also deleted due to duplication errors. Papaver somniferum seed extract is also removed in accordance with the requirements of the "Strengthening Supervision and Management of Papaver Somniferum Food". IECIC 2003 was a giant step forward for cosmetic companies in determining the regulatory status of an ingredient and providing a solid reference form which to choose ingredients in order to avoid the complicated and costly procedures of new cosmetic ingredient registration. Although at the time the IECIC was far from comprehensive, it was still the gold standard for cosmetic companies looking to comply with Chinese cosmetic regulations. CFDA has been constantly endeavoring to improve the IECIC and align it with the international market and global regulatory standards. Fast forward 11 years and the IECIC has evolved to become an integrated inventory containing 8783 ingredients. The gradual improvement of IECIC has seen the use of cosmetic ingredients standardized, the determination and registration of new ingredients facilitated and the safety of cosmetic products promoted. It is undeniable that IECIC 2014 represents significant progress for China’s cosmetics industry however there is still a long way to go. Certain ingredients are still excluded from the inventory despite being generally accepted as safe. Meanwhile, with the appearance of new ingredients and the rapid development of the cosmetic industry, the IECIC definitely requires continuous updating. Want to know the registration procedure of new cosmetic ingredients? Please click the following links for further information. 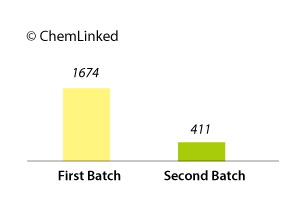 Bio: As a regulatory analyst and managing editor Ms. Angelita Hu reports regulatory updates and shares her interpretation on regulations at ChemLinked. She works as editor/reporter for over 5 years and has extensive knowledge of cosmetic regulation in Asia Pacific regions.